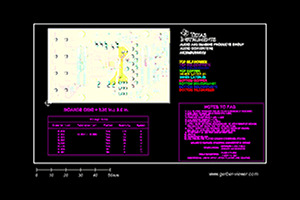 TIDA-01606 pre-release software is now available for download TIDA-01606 software per request. It is not fully validated for production use at this time, and should be used for informational and laboratory test purposes only. 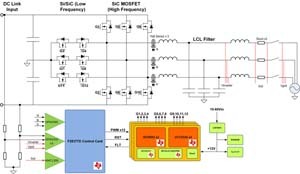 This verified reference design provides an overview on how to implement a three-level three-phase SiC based DC:AC grid-tie inverter stage.Higher switching frequency of 50KHz reduces the size of magnetics for the filter design and enables higher power density. The use of SiC MOSFETs with switching loss ensures higher DC bus voltages of up to 1000V and lower switching losses with a peak efficiency of 99 percent. This design is configurable to work as a two-level or three-level inverter.The system is controlled by a single C2000 microcontroller (MCU), TMS320F28379D, which generates PWM waveforms for all power electronic switching devices under all operating modes.